If you are looking for a career option where you can grow prosperously, here is the best career stream to choose a banking job. We all are aware that banks are the backbone of financial aspect of our country. Banks are the never ending sector for job offerings. Banks operate on a hierarchical structure of authorities. This is the main reason because of which person can get a bank jobs according to their skill and work capabilities. Experience in the field will give you good hike and promotions. Such a hierarchically arranged well-structured work environment and defined hours of working takes the banking jobs to best option as a career. In addition to all such facilities socially a reputation is considered for a person working in a bank. With the rapid change in technology banks are also transforming to a convenient methods of bank operations. Every potential aspirant can get a bank job accordingly. 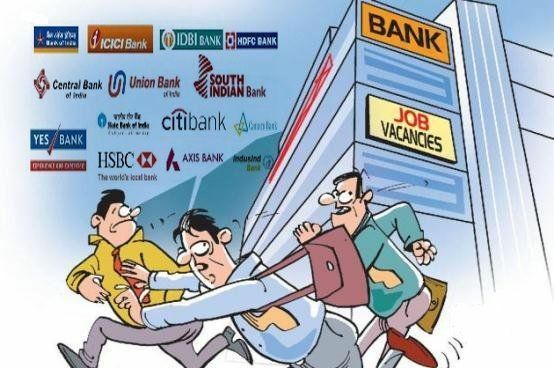 Like every year banks announce number of vacancies in different private and public sector banks. Government jobs in bank sectors became the most preferred job within last few decades. Every year a huge number of aspirants prepare for bank jobs. The entry level exams are conducted by the banks after entering and gaining experience of the position and sector person is promoted to next level of authorities and responsibilities. By gaining such experience aspirant can reach top position in the bank. The recruitment advertisements are published by the banks in various newspapers. Other than such employment newspapers aspirant can refer to media and news talking about such openings. Internet acts as a best friend using which you can be a part of recruitment websites available. There are various types of jobs available in banking sector through exams, but to apply for a job first thing to be confirmed is the eligibility criteria of the job mentioned by respective recruiter. As per the bank jobs are concerned, minimum eligibility banks asked is the graduation in any field. But aspirant must have mathematics background in academics and knowledge about financial issues and bank transactions. Commerce background people have added advantage to get into a bank career. Next thing to be considered is the procedure of getting a bank job. Keeping track of the openings published by banks every year is the first aspect. According to the mentioned bank's specifications you have to apply online or offline. After applying for the bank openings you can go for training of IBPS bank exams and you have to give the exam conducted by IBPS. Many training centers are providing preparation assistant to Candidates want to get in the bank career. Many banks conduct their own standard exam as an entry level written test. Candidate must be prepared for the exam with good general knowledge, mathematics and confidence over English language with efficiency in financial market aspects. After clearing written exam candidates have to face an interview. In such face to face interview aspirant's personality is checked and most important problem solving capabilities are tested in the interviews. Once the recruiter gets a clear selection finalization they will give an appointment letter which confirms that you are hired for respective position of the bank job. Minimum of 6 months training is given to a fresher in which they train the candidate about the work responsibilities and strategies to be adopted by the candidate. Many banks provide stipend in training period. Here we are providing banks and their latest opening and vacancies details to make easier for you to find out the openings in private sector banks and public sector banks. You have to start preparations for appearing in bank exams and clear it to get a best career. Plz let me inform if any particular post available for me. How to apply for job in state bank of India? IAM SREEDEV8I B.COM COMPUTERS GRADUATION WITH PGDCA. 5Y EARS ACCOUNTANT EXP IN PLTD COMPANY. PRESENT MBA FINANACE STUDY PRIVAT ACHARYA NAGARJUNA UNIVERSITY. i am yasmin from odisha bhubaneswar, i am graduation with PGDCA i want job in any bank now i am doing a job in accountant plzzzz reply must. sir tell me about bank $ finance job. I am Mr. Jogesh mishra from chhattisgarh.i am SSM(PNB metlife)Raipur branch.there is any vacancies please inform me.sir please call me(9981899700). sir 7 year in this field. i want to do job it important for me please. of all i wish get well soon. and thanks for replying .please its my request that next test conduct with all four subjects. because lots of this site viewer are going to appear for IBPS specialist officer and Gramin Bank PO. so that will be beneficial to all. As per my opinion, website maintain with single person is difficult. so please make a separate corner, where we guy can share study material and questions for discussion. i am interested in bank job i have completed graduation . there is any vacancies please inform me thank u.
I am from rajasthan sir please mail me any vacancies my phone 9413570130. I am looking for good job in Indian banks? I am 12th passed. I want to do clerk job in sbi. Please inform about clerk jobs in other banks also. I m a retiered army junior commissioned officer. which is suitable post for me that i serve to the bank. Hello sir, I want to do any job in SBI. Please give me a job. Im looking for a bank job. But I have never worked at any bank. So i'm completely fresher for this job. So dont want any specific post, anything will do like document collection or some other small posts. I have worked in retail line for 2 yrs as a salesman in nike sports shop. Plz let me informe if any particular post available for me. please update the finance bank jobs. How to Get HDFC Bank Account Mini statement by missed call and SMS?